Jennifer Sygo is a dietitian, sports nutritionist, author, and speaker specializing in nutrition for prevention and performance. After completing an undergraduate degree in Biochemistry at McMaster University and a Masters of Science in Human Biology and Nutritional Sciences, specializing in Nutrition, Exercise, and Metabolism from the University of Guelph, Jennifer joined the team at Cleveland Clinic Canada in 2006, where she uses evidence-based strategies to help busy professionals, athletes, and active individuals make simple dietary changes to improve their health and performance, and reduce their risk of disease. A leading sport nutritionist, Jennifer works with athletes ranging from weekend warriors to athletes in the NBA, NHL, Major League Baseball, and professional tennis. She has provided nutrition services for the Toronto Maple Leafs and Triathlon Canada, and currently serves as team dietitian for the Toronto Raptors, Athletics Canada, Swimming Canada, and Gymnastics Canada. Jennifer is also a popular speaker and seminar leader, and provides presentations and keynote addresses for major corporations and conferences. Jennifer's nutrition expertise is routinely featured in the media, including The National Post, The Toronto Star, and CBC's The National. 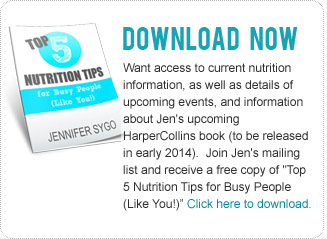 In 2014, Jennifer's first book, "Unmasking Superfoods: the Truth and Hype about Acai, Quinoa, Chia, Blueberries, and More", was published by HarperCollins Canada, and became a national best-seller. Outside of her work, Jennifer is an avid sports enthusiast, and a proud mother of two young boys.